In years past, the Fiesta Bowl organization held a huge block party in downtown Tempe on New Year's Eve, one of the biggest block parties in the country, but the last one was in 2011. Instead, the official Fiesta Bowl party will celebrate the game itself, with a tailgating party on the same day as the college football game, which means they no longer are a sponsor of a Mill Avenue Block Party. Due to declining attendance, the NYE Block Party on Mill Avenue has been scaled back and there are no longer designated party areas, tickets for events, or stages of entertainment. Instead, participating local bars, restaurants, shops, and activity centers in the Mill Avenue District of Downtown Tempe will open their doors all night long so guests can ring in the New Year together. Bars with specials, party favors, music, and DJs are the highlight of the night, but many of these have a cover charge and of course an age requirement for entry. However, there will also be food trucks and midnight fireworks on Mill Avenue, so even if you have a kid with you, you should be able to find some forms of entertainment they'll enjoy, and if not, check out our "Big New Year's Eve List for Phoenix." Although it has changed over the years, the NYE Block Party on Mill Avenue is still a local tradition that some people simply won't miss. Participating locations open their doors at 5 p.m. on December 31, 2017, and most don't close until 2 or 3 the following morning. Because a general area for gathering outside will not be closed off as in past years, taking open bottle or drinks outside of the bars will not be permitted unless they have made special arrangements for their own outside block party—and some of them will. For instance, El Hefe and Dierks Bentley's Whiskey Row will again hold the Champagne Ball block party near Sixth Street and Mill Avenue, and Handlebar and Fat Tuesday will also have a Champagne Ball with dancing and a midnight confetti blast. Weather is usually mild in Phoenix around this time of the year, however, temperatures can drop at nighttime, especially if you're closer to higher elevation regions just outside the city. Here are some weather statistics and tips that time of year, and for more information on this exciting event, visit Tempe Tourism online. Public transportation is highly recommended if you're heading to Tempe from Phoenix, especially as Mill Avenue will be closed to vehicular traffic for the duration of the block-party-turned-bar-crawl. Thanks to one of the sponsors, Coors Light, though, all buses and Valley Metro Rail rides will be free starting at 7 p.m. on December 31 until the end of regular service. For more info regarding NYE Metro schedules, visit the official website or check out our " Public Transportation in Phoenix" guide. If you don't want to take public transportation, there are parking meters and a few lots nearby including the Hayden Square Garage and West Lot at 3rd Street and Ash Avenue, US Airway Garage at Ash Avenue and Rio Salado Parkway, University Square on University Drive and Forest Avenue, Hayden Ferry Garage on Rio Salado Parkway just east of Mill Avenue, Rio Salado Parkway lots east of Priest Drive, and Centerpoint Garage on Ash Avenue north of University Drive—be prepared to pay additional fees for special holiday event pricing in these lots. Planning on getting some shut-eye to start off the New Year? 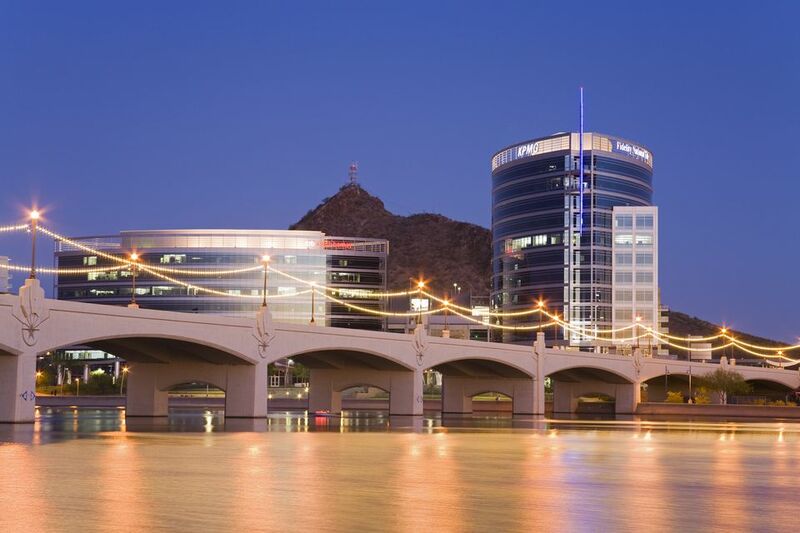 Here are some recommended hotels in Tempe, but you might also want to stay at a hotel that's on the Valley Metro Rail line, so you don't have to drive.